South Tottenham station changes: what do you think? 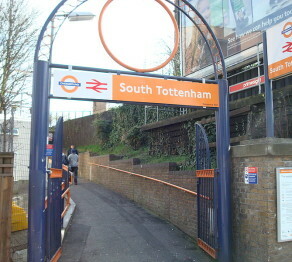 Changes are planned at South Tottenham station, which has seen a large increase in passengers over recent years. It is now the busiest intermediate station after Blackhorse Road on the Gospel Oak – Barking Overground line. Plans under the “Access for all” scheme would see the introduction of lifts to platform level and the installation of automatic ticket barriers. This is a welcome continuation of TfL’s provision of step-free access, such as the new lifts at Gospel Oak station and . The Barking – Gospel Oak Line User Group (BGOLUG) has raised concerns about the specifics of the current plan, and would like to hear the views of users of South Tottenham station. This entry was posted in Transport and tagged Accessibility, London Overground, South Tottenham station, Transport for London on March 28, 2013 by admin.